I grew up listening to George Thorogood. Before I showed up to this planet, my dad was a rock and roll star. He casually listed Thorogood's cover of "Who Do You Love" as one of the greatest songs ever made. I now realize he was right. Who do you love?? Do you love the young and carefree gal that goes with you everywhere - even on your motorcycle? Do you love the mature woman? Or do you love the idea of a woman, but prefer to focus on other things; even though these pursuits may strangle you? I created this illustration originally for the Phidias Gold show "Stack the Deck" (original board still available, email phidiasgold@gmail.com for details). 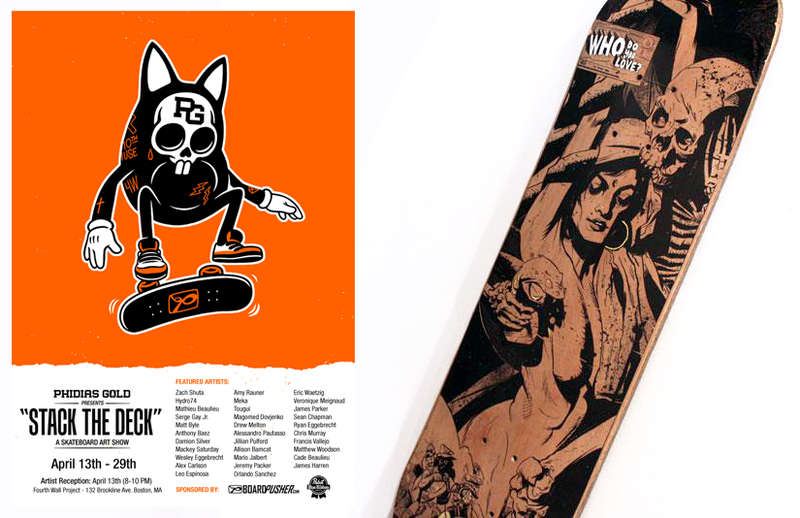 Above, you can scope out the line art version, and the "candy" version of the skate deck. For the show I transferred the inks to a board and selectively painted on top, which you can check out in the last image. I will be releasing 3 limited runs of the skate decks. Two of the designs are seen above, and 1 additional colorway will be unveiled soon. Check this space for the announcement of availability!! Lastly, I am on Facebook. The Blk/Wht one is equally as effective. Nice piece man. I'm wondering how.... And why you've depicted my first and only long term girlfriend. Seriously, her face, steez, everything. A damn gypsy pirate with a bindi on her forehead. Or some sort of pineal gland/third eye representation. Is this a typical desire? I like the way you applied the color to the b/w drawing. Man you can draw, great blog! Amazing! It has really nice atmosphere.